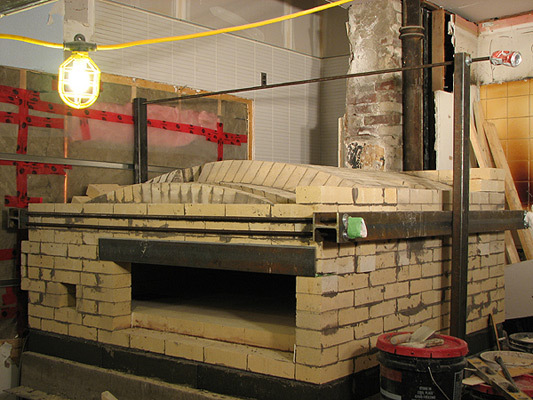 This wood-fired bagel oven was built for one of four location of The Bagel House - a very successful Toronto bagel company. Both owners of the company, partners in the business, spent years working in the most famous bagel bakeries in Montreal prior to opening their own first bakery in Toronto. Montreal-Style Bagels are hand-rolled and baked according to the authentic recipe by boiling them first in a honey bath and then baking on the hearth, heated by open wood fire, achieving unique characteristics a true bagel-lover would expect from an authentic Montreal-style bagel. 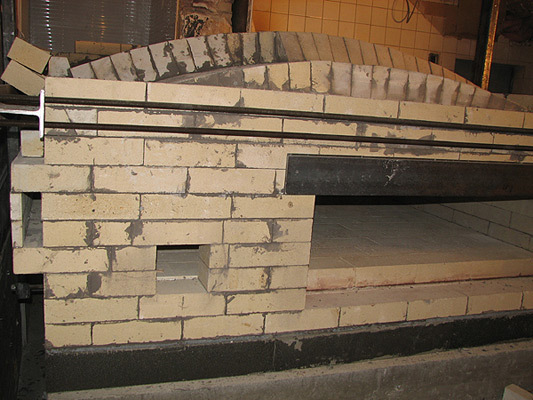 This oven features proper proportions for higher efficiency, properly balanced mass and high level of insulation, which facilitate superior performance. 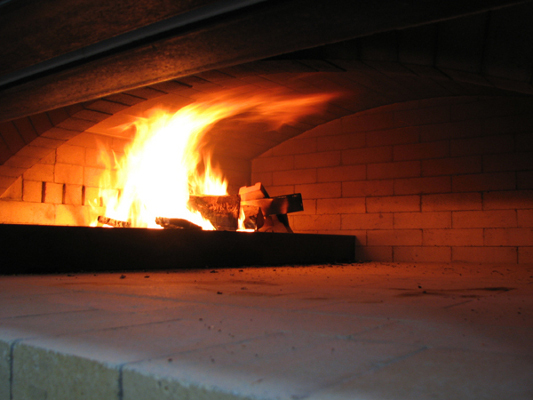 The Bagel House owners testify that this oven uses many times less wood and bakes much better than old ovens at other locations, built by a Montreal-based company 15 years ago. 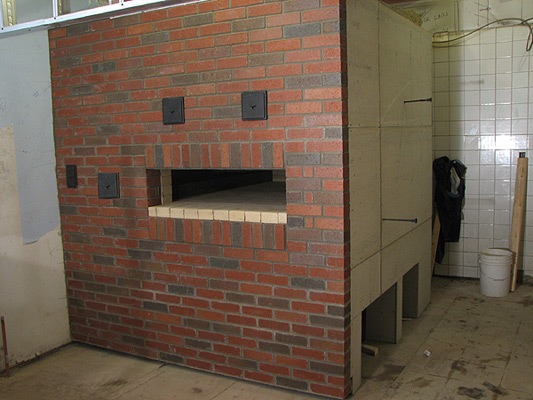 Note that this is the smallest commercial size bagel oven suitable only for café-style locations that do not produce bagels for wholesale. 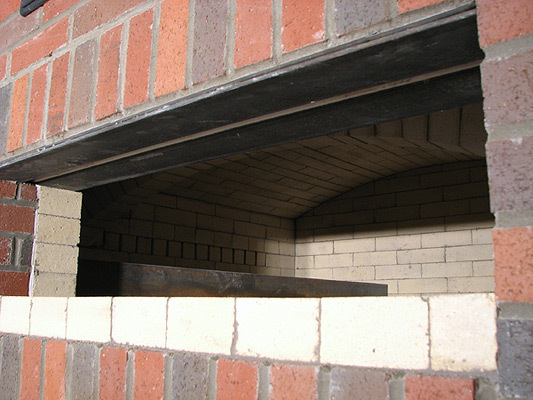 Wholesale bakery-style locations must use larger ovens, sized according to their production plan. 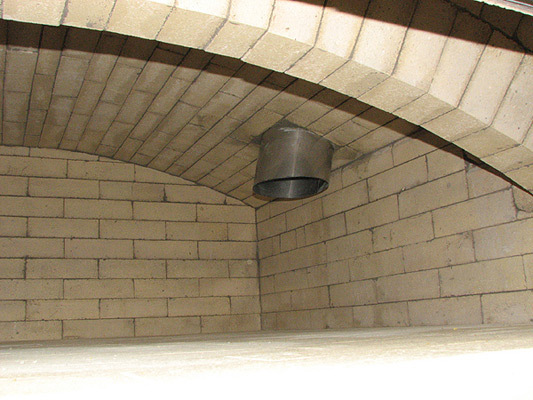 Oven is built over a 4" layer of Foamglass structural insulation laid on top of a reinforced concrete slab supported on a steel support system engineered and built by others. Foamglass is protected with Durock cement board. 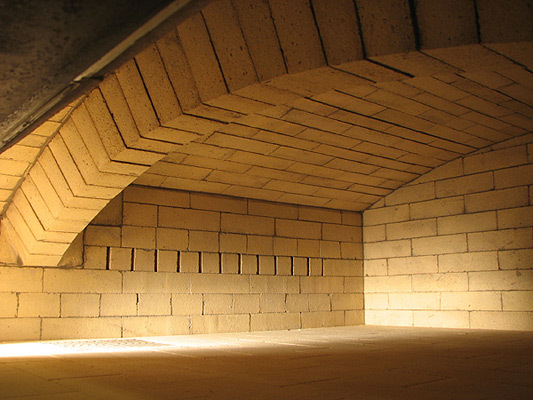 Skew courses for stepping down arches the in reduction part of the vault and channel for secondary combustion air with outlets. 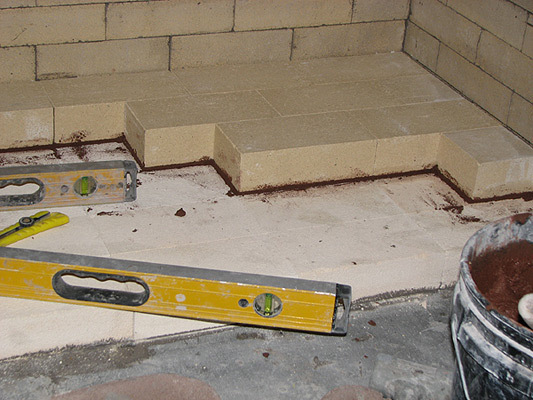 Skew courses are in for the complete vault. Note secondary air outlets in the wall below. 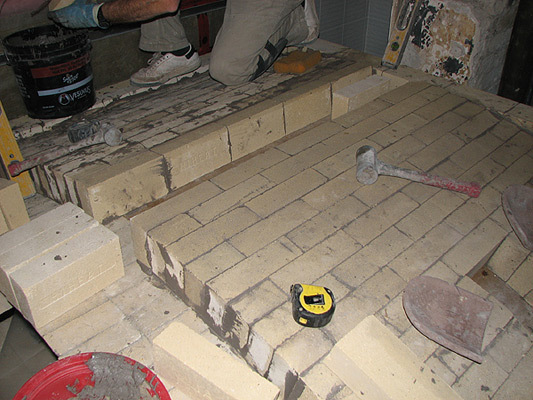 Hearth bricks are laid over additional layer of insulated firebrick in clay/sand mixture for easy removal should replacement of hearth bricks will ever be required. 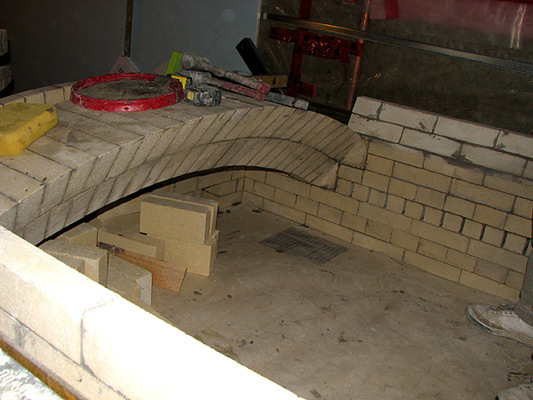 First brick of the lowest arch, forming smooth reduction lip is laid. 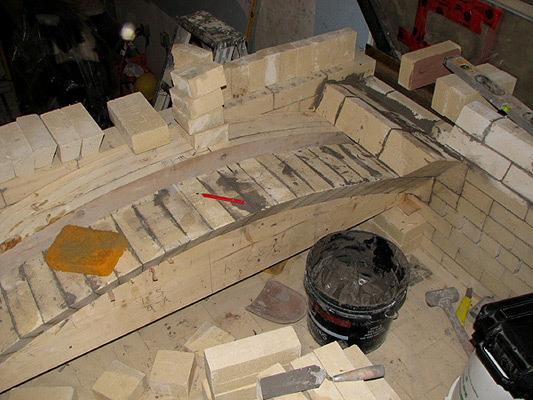 The lowest arch is in place with the next one started on top. This one will form a throat. 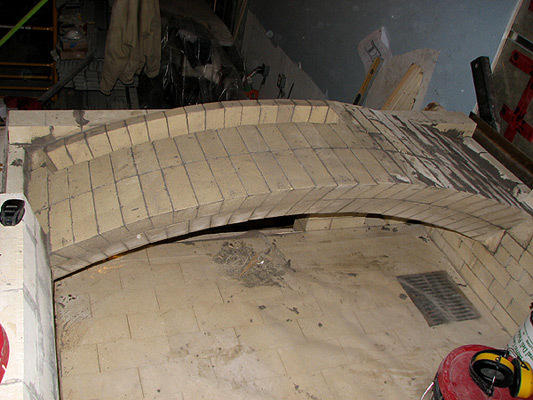 The second arch(vault) is in place. 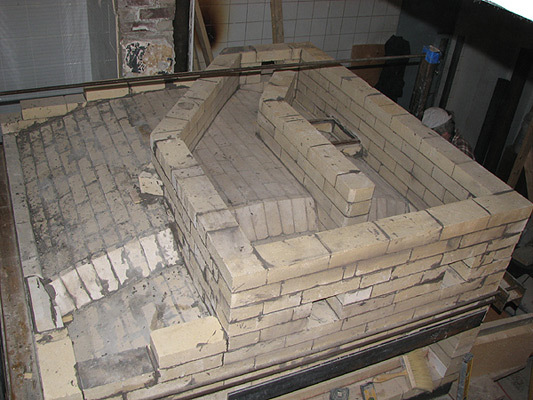 Note: throat and grates over the ash-dump damper in the hearth. The first and the second arches from below. Note angles for smooth transition. The first and the second arches. Another view. The harness is in place. 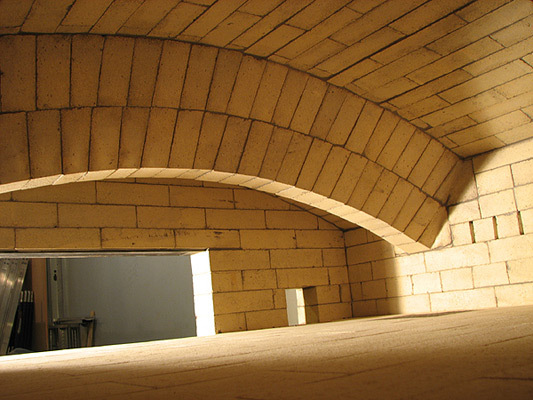 The main vault is constructed. 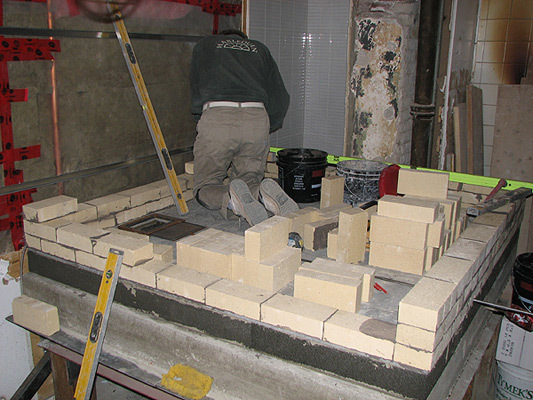 Last bricks in the main vault. 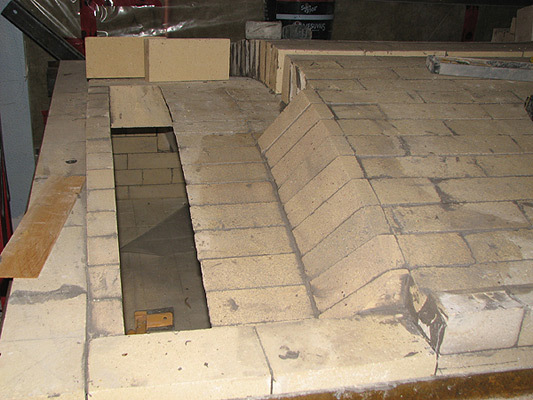 Main vault is in place. 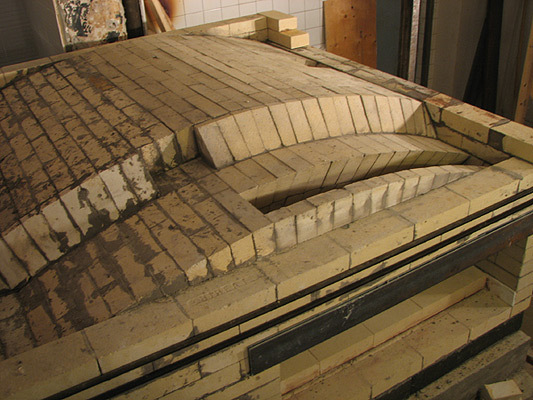 Angled cut-offs are used to smooth-out a step in the future-to-be smoke chamber. Sergei is cleaning the vault. Finished oven inside. The first view. Finished oven inside. View from inside. Finished oven. Another view from inside. Vault is finished. 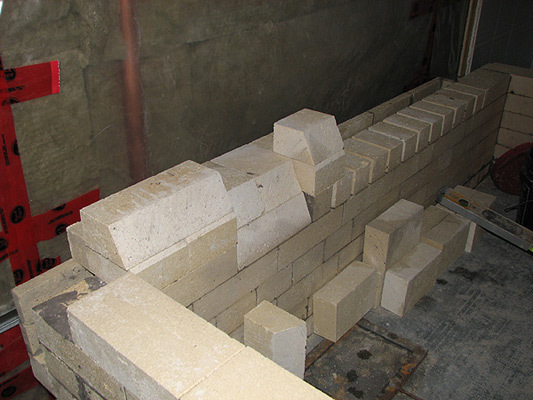 Before smoke chamber is built. 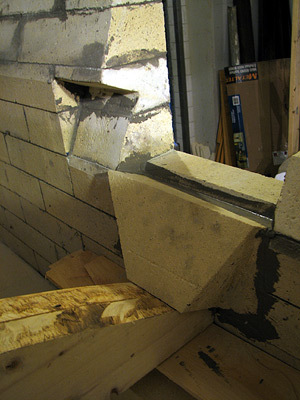 Note: I-beam harness with additional support at the middle. 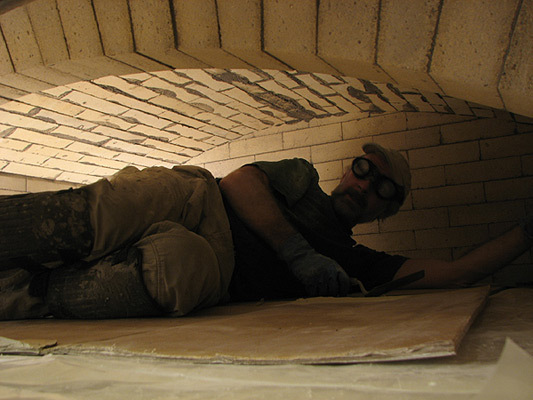 Vault from the top before smoke chamber is built. View from the front. Note: square opening for primary air supply and the rectangular opening for secondary air supply. 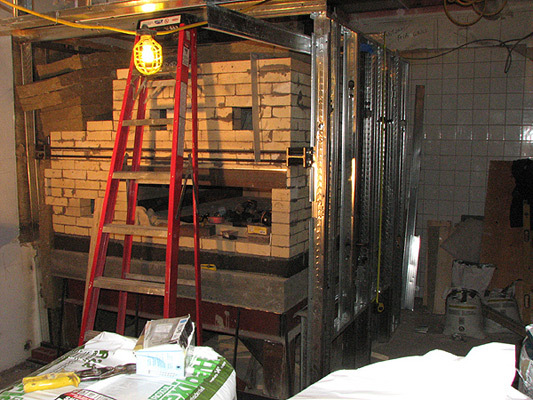 Smoke chamber is built. 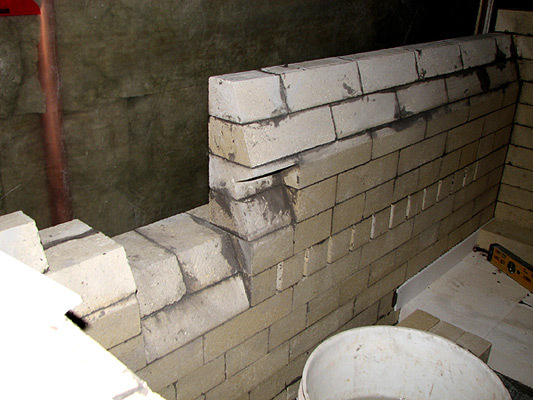 Note: clean-out openings in its walls and a damper for the second chimney outlet in the main vault. 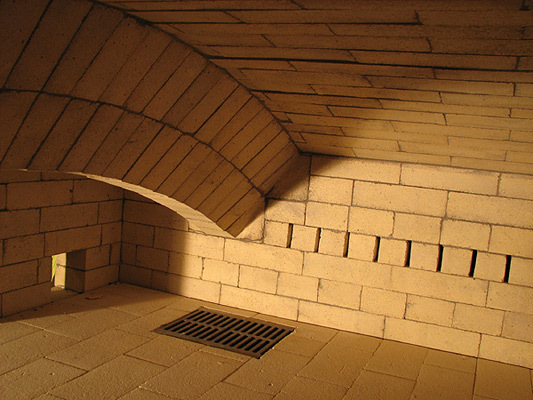 Top view of the smoke chamber. 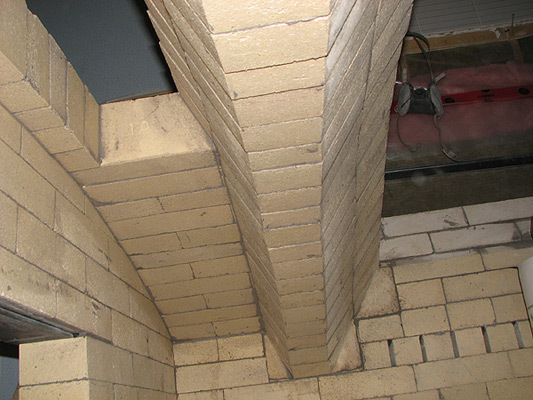 Chimney connection is at the end. 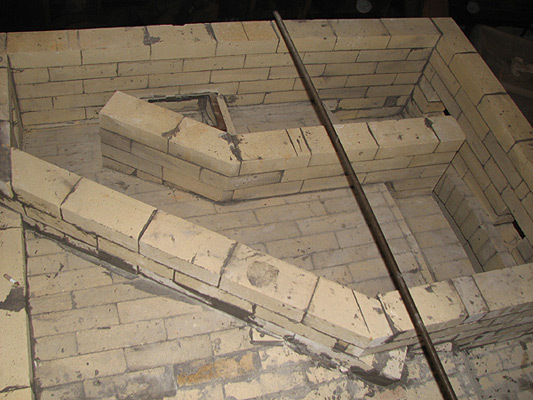 Castable refractory is used to smooth-out area around the damper to reduce undesired turbulence. 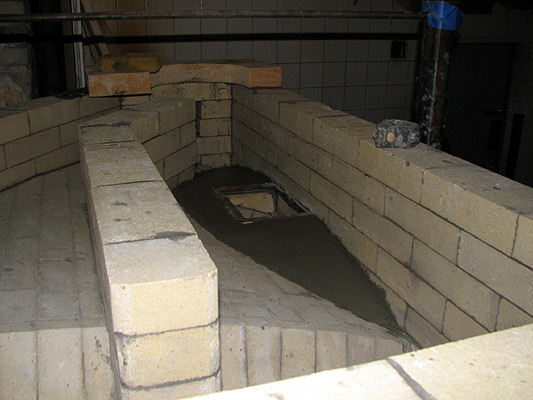 The area outside the smoke chamber is sealed with 2" layer of castable refractory. Stainless steel liner used to reduce height of the extra exit to necessary 62% of the vault's height. 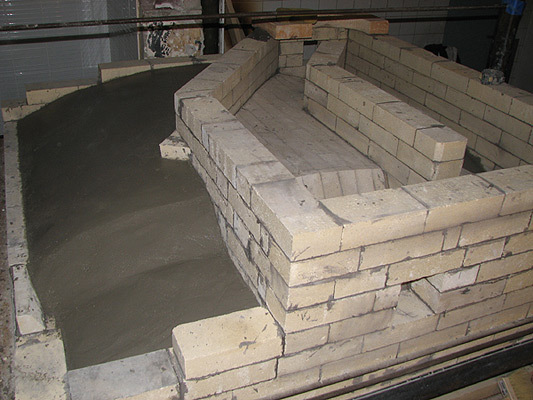 The liner is embedded into castable refractory mix. 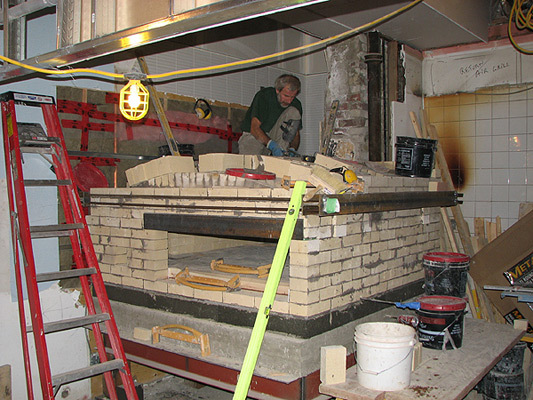 Steel studs form facing walls on the sides and top of the oven. 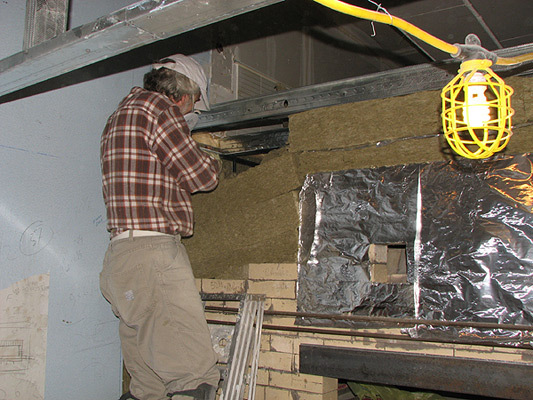 Multiple layers of mineral wool insulation with foil in between are laid over the oven's refractory core. Finished oven. Loading opening close up.